Ah, luggage. It’s bulky, clunky, awkwardly-shaped, and not nearly attractive enough to be disguised as a petite side table, despite what Pinterest might have us believe. Unless you have a vintage suitcase, in which case you can totally use it as a side table or nightstand. Whether you’re a regular jet-setter or a “once a year visit to home” kind of person, you probably have at least one travel bag that claims precious space in your house or apartment. But how do you manage to find a convenient, hidden spot for your beloved carry-on or the massive four-wheeled suitcase you used when you moved to France? You have to get creative, resourceful, and organized. And since there’s something strangely satisfying about coming home after a trip, unpacking your suitcase, and putting it securely out of sight, we’ve compiled a list of 10 tips and tricks for storing all your luggage, no matter the type. 1) Inspect and clean your luggage. Before you store your suitcase wherever it will fit, give it a quick inspection for dirt spots, tears, or wet patches. 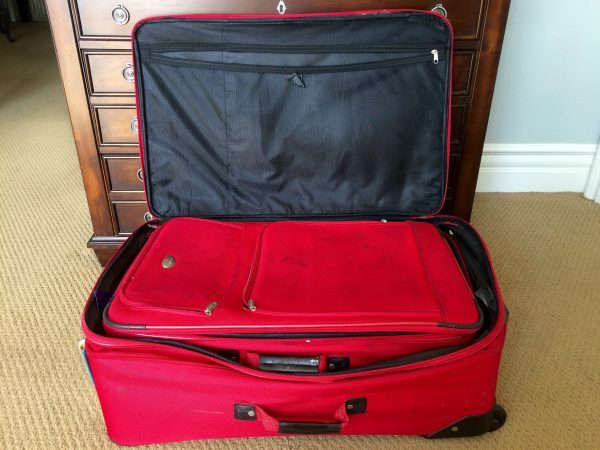 Tumbling through airports, baggage claim centers, car trunks, truck tires, and other nightmares will leave your suitcases looking worn over time. To keep them in good shape, check for any wet areas on your bag that could lead to mold or mildew. After you unpack, toss out any bits of trash you find, turn out the pockets, and give your bag a shake to get rid of any dirt and sand remnants. 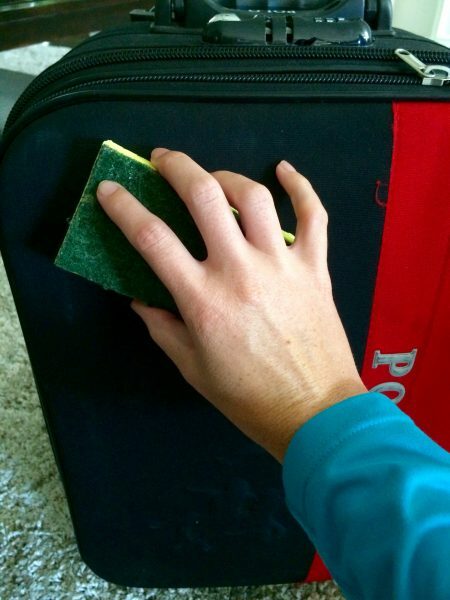 If you’re feeling ambitious, give your suitcase a gentle clean using this method from Eagle Creek. Here’s the gist: Clean your suitcase by hand using a damp cloth for the interior, and warm water and a sponge for the exterior. Then hang it to dry. Simple. 2) Check your bag’s configuration before you put it away. Lauren Williams, professional organizer and owner of Casual Uncluttering LLC, recommends taking one last glance at your bag before you store it to make sure it’s as slim and compact as possible. This means making sure all the inner pockets are well folded and that any expandable areas on your bag are zipped up. “It’s silly, but [making sure] the set of zippers that adds an extra inch is closed can sometimes make a difference,” says Williams. Same goes for handles, buckles, and detachable straps. 3) Protect your luggage from damage by choosing the right location. Double-check that your luggage is going in a cool, dry spot. Any areas subject to intense humidity can cause moisture buildup and mold, which will either completely destroy the integrity of your bag or turn its sleek, elegant exterior ugly. Avoid any areas that receive direct sunlight, as too much sun on your bag can fade its material over time. While you’re at it, make sure your bag is in a bug- and pest-free zone, and that you’re keeping it far from sharp objects that could potentially fall and scratch or rip it. If you want to go the extra mile to ensure your bag’s longevity, Williams recommends investing in a luggage cover to keep your bag free from dust, mold, and dirt. Amazon has a diverse selection of luggage covers — from clear plastic and nylon to neon colors and polka dot patterns. 1. 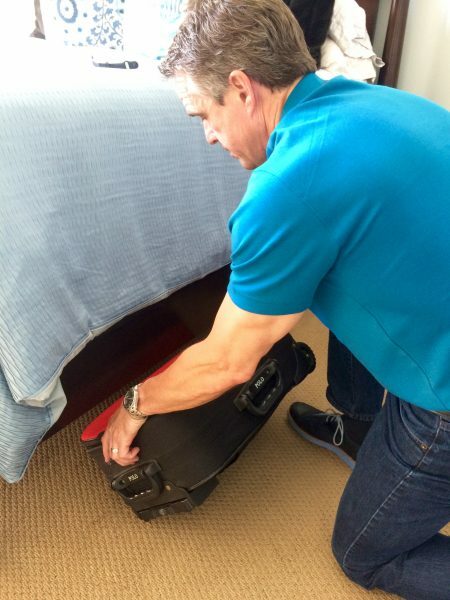 Store luggage under your bed. You’ve heard it before, but the space under your bed is one of the easiest, most convenient spots to store your suitcases. If your bed is high enough, you’ll probably have a foot or two of dead space perfect for sliding in your carry-on or duffel bag. Donna Smallin Kuper, organizing expert and author of Clear the Clutter, Find Happiness, recommends putting your luggage inside a large trash bag to keep it clean and dust-free while it stays under your bed. Only have approximately six inches of space beneath your bed and desperate to find a place to store your luggage? Williams recommends using bed risers. You can buy a set of sturdy, affordable risers at your local Bed Bath & Beyond, Target, or Home Depot. They go beneath the feet of your bed frame to lift it up and give you a glorious two extra feet of prime storage space. 2. Store your carry-on inside a suitcase. It may seem obvious, but using your largest suitcases to house your other suitcases can make a world of difference in the amount of space your bags occupy. Your carry-on bag can easily fit inside your biggest suitcase. You may even have one or two medium-sized bags that can hold your carry-on and tuck perfectly inside your largest bag like a set of Russian nesting dolls. But don’t stop there. Gather all your duffel bags, beach bags, or weekend totes and fold those gently inside your smallest carry-on to maximize space. The only issue with this luggage storage idea is that it can be a tedious process to retrieve whichever bag is at the center of the stack, especially when you need it quickly. That’s why this strategy works best for people who don’t travel frequently, and therefore don’t need to access their bags on a regular basis. Either that or people who just loved playing with Russian nesting dolls as a kid. 3. Use your luggage to store other stuff. The shorts, sandals, and bathing suits you won’t see again until next summer? Pack them up in your suitcase. The chemistry textbooks from college you’re saving just in case you decide to apply for grad school? Stack them in your carry-on. Holiday gifts you need to hide? Tuck them in your duffel bag. 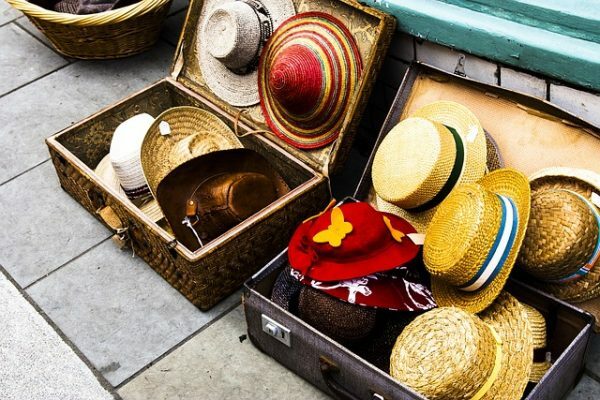 Other items you can store inside your luggage include, but definitely are not limited to, boxes of old letters and photos, tool kits, books, toilet paper, and toys. The possibilities are endless. 4. 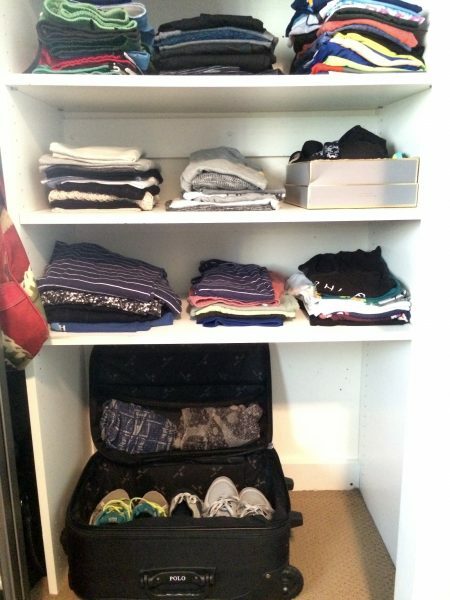 Store your suitcases on a high shelf in your closet or garage. Kuper recommends utilizing the dead space at the top of your garage or closet by installing a sturdy shelf there. Just make sure the shelf is wide enough to fit your suitcase when it lies sideways, otherwise you risk the shelf breaking or bending from too much weight. If you have several suitcases and only enough room to store one, double-check that your shelf brackets are secure and try out the Russian nesting doll method to fit them all up there. 5. Turn your suitcase into a shoe rack. If you have a decent amount of floor space in your closet, you can store your suitcases there. The trick is to lay your suitcase in the exact position you would if you put it on a luggage rack in a hotel room: flat and open, with the open side facing toward you. 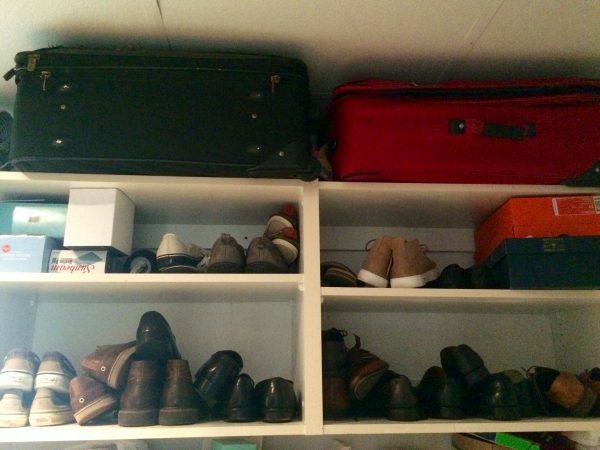 With this method, you can store your shoes in neat rows in the open suitcase. Just make sure to lay a towel or cloth at the bottom of your suitcase to protect it from dirt and grime. 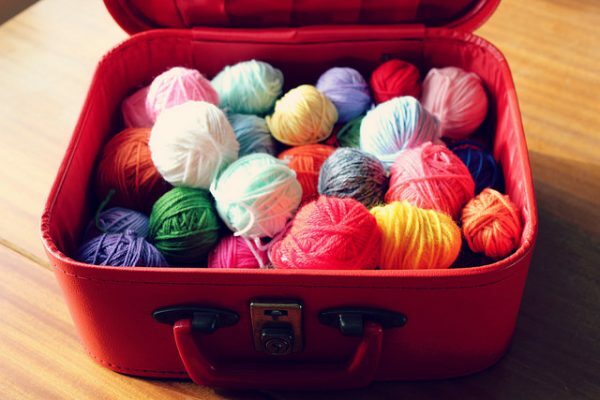 If you already have a shoe organizer or rack, you can use the suitcase to store plenty of other items like shoeboxes full of folded gloves and hats, rolled up scarves, belts, holiday decorations, or handbags. 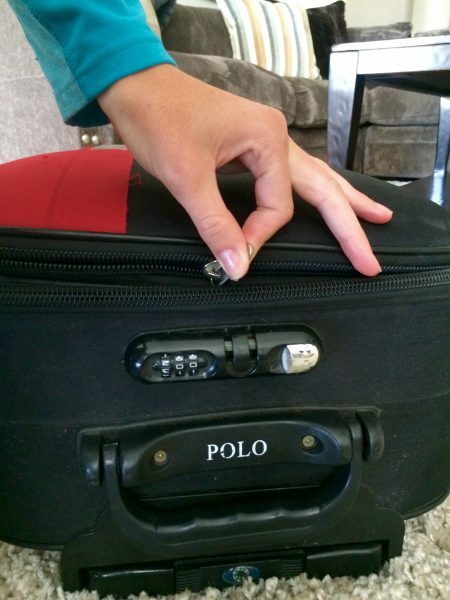 If the lid of your suitcase has a zippered storage pouch, take advantage of that, too. 6. 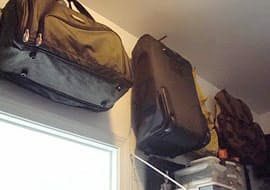 Hang your luggage from sturdy hooks or pegs. Similar to the shelf method, this option works best if you have a closet, garage, or utility pantry with available space higher up. If you do, you can install a sturdy peg or hook to hang your bag from, provided that it has a handle at the top. Since all the weight of the suitcase will be concentrated on one point, though, be sure to keep your bags as light as possible if you go this route. Don’t try to stack your suitcases or fill them with your out-of-season coats — just keep them empty. 7. Let MakeSpace pick up, store, and deliver your luggage. If your home doesn’t have the space to fit all your luggage, or if you know you won’t be traveling again until your trip to Thailand in eight months, schedule a MakeSpace pickup . We’ll pick up your luggage (along with any other items you might want to store) and transport it to our secure, temperature-controlled storage facility. The best part: We’ll also create an online photo catalog of your stuff. So the minute you decide to book a trip to Australia, your luggage will only be a few clicks away from arriving on your doorstep.